Nintendo DS is one of the battle courses featured in Mario Kart DS. It is similar to the Nintendo GameCube stage from Mario Kart: Double Dash!! in that racers compete on a large system floating in outer space. The arena was designed to resemble the earliest Nintendo DS model, which is also its namesake. 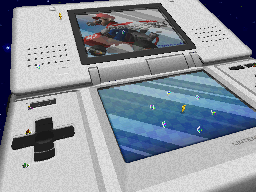 There are two connected platforms, which are the top and bottom screen of the large Nintendo DS. Like with the handheld design, the top screen is slanted while the bottom one is flat. Although it is not as curved as the original unit, the Nintendo DS arena even includes minor details such as the microphone and speakers. The top screen dusplays the title screen of Mario Kart DS. The course has no obstacles; however, unlike the Nintendo GameCube battle course, there are no walls to protect drivers from falling off the stage. The missions 1-5 and 7-6 take place on this course. Both missions have the same objective where the racer (respectively Toad and Mario) must drive through a sequence of numbered gates in order. The stage's appearance in the early kiosk demo. The stage has a few aesthetic differences in the kiosk demo of Mario Kart DS. Instead of outer space, the backdrop shows a green sky and pink clouds during sunset. Both of the arena DS's screens shows a different, preliminary image: the bottom screen shows a copy of the stage's backdrop, while the top screen shows the Nintendo DS logo. This page was last edited on November 12, 2018, at 16:36.